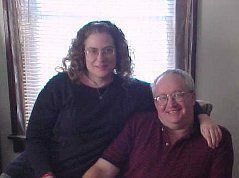 We are the Hastad's, Paul and Connie, happy little farmers from Iowa. Paul is a relocated Minnesota native, Farmer by birth, Computer repair and programmer by trade. Connie is a homemaker. The Chickens are hers...and only hers. Connie started with 5 little chicks sold her by a friend. 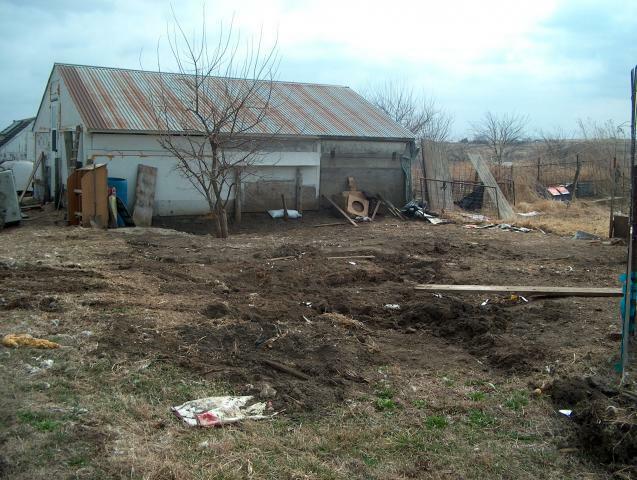 and converted it into a small chicken coop in 2009.
and the Chickens started moving in... some, before she was ready. 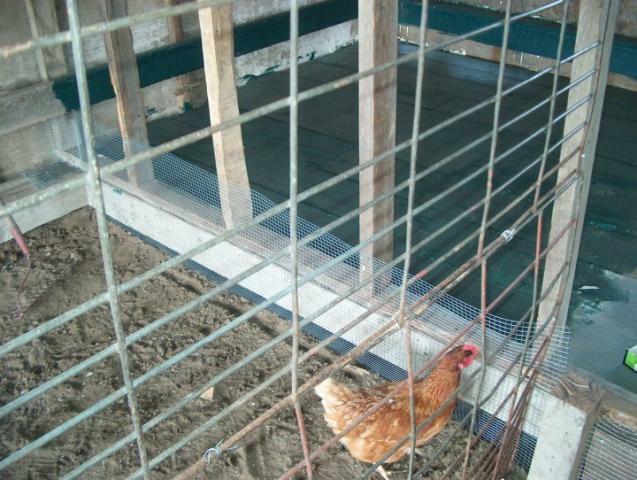 This hen is now known as "Greenie"
she got into when the nesting area was being painted. Oh, But what's this?, Her little Coop has gone missing! Hah! I moved it! Can you see it? Just peeking out from the front corner of the big hen house? And look at the great mess I left behind for that Dear Wife to clean up! Ah, there it is...Just where she wanted it. 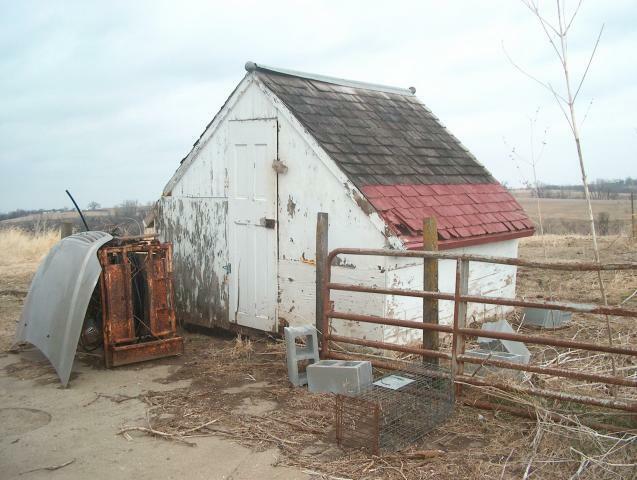 On the other side of the big Hen House, along with a lot of junk I have to move. But, let's just see what she does with that coop now that she has it where she wants it! Hah!, says Connie, I got that thing up off the ground and put up a fence...all by myself! I used DH's floor jack and a car bumper jack, and up it went! I only dropped it once. Just waiting on the mobile home skirting from Mom's place to finish round the bottom, then paint! Oops! I guess I just couldn't wait, the occupants are here! 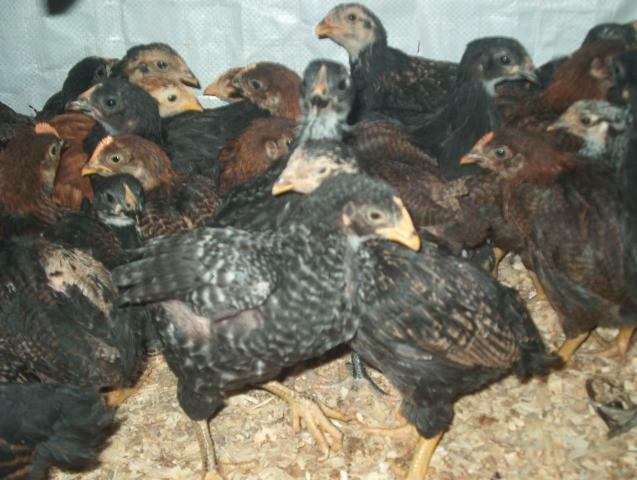 7 week old chickens, getting aquainted with the new digs. 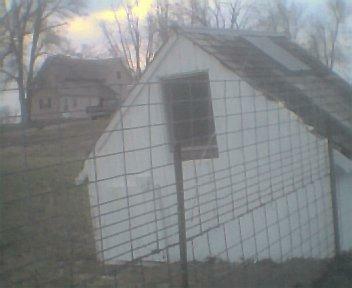 There are 6 hens that will go to Mom's place later in the Spring, and 7 roosters. Will be Cornish X added in later. 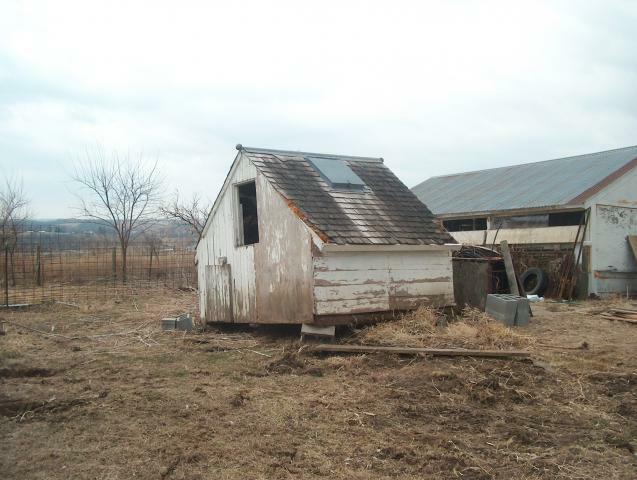 This is to be my Meatie Coop. Sand under the roost, hay everywhere else. Loving my relocated little coop! Stay tuned for further installments of Connie's Follies!! So the Chickens stay...but only as long as Connie lives. Overall, this coop is good. 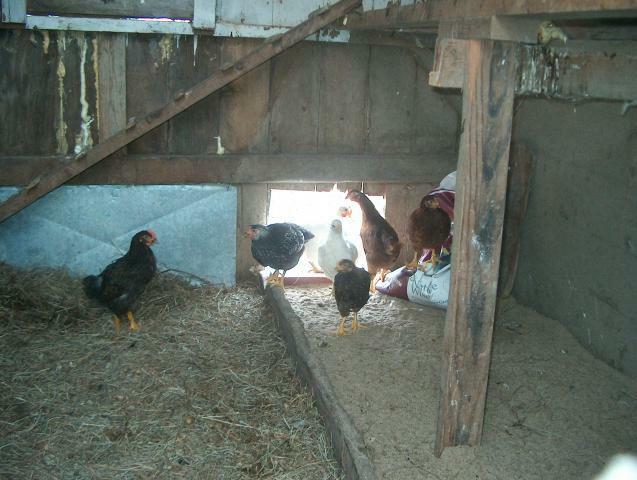 Somethings that I would improve upon are the ventilation and the amount of light in the coop. 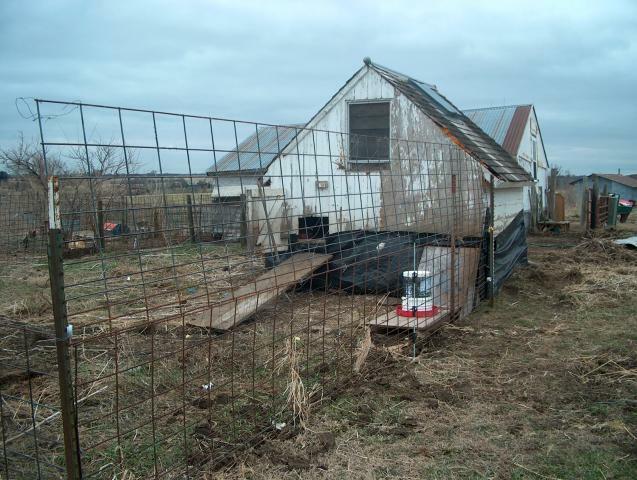 I would also increase the space of the coop as it looks a little on the small side for that number of birds. I would keep in mind ease of access with this coop especially with the run in the off chance that you have to enter it. I like the rustic vibe!